I got my hair cut today. It was desperately needed. Wanna see? Of course you do. Also, I got a new scale. Finally a good one that (hopefully) won't go all wackadoodle on me. I'm taking her for the maiden voyage tomorrow. Speaking of tomorrow, it's Husband and my anniversary! SEVEN WHOLE YEARS OF WEDDED BLISS. I feel so lucky to be married to my best friend. Life is good. We are going out to dinner to celebrate tomorrow night. Should be interesting as it is not a Cheat Day for me, so I'll have to really order carefully. Good practice for me I think. The Plan continues very well and I certainly don't want to throw a wrench into the works. I didn't get my usual Cheat Day yesterday because I'm doubling up for my birthday weekend coming up. Normally I would not want to double up but under the circumstances, it just can't be helped. But I have decided that I am honestly going to try to just eat as healthy as I can, and while I do plan to have birthday treats, I hope to enjoy them in moderation. Oddly, I haven't really missed Cheat Day this week. I thought about it a few times during the day yesterday, but some part of me seemed almost relieved to just have another good ol' day on The Plan. Makes me wonder if I should change Cheat Day to a bi-weekly or even monthly thing. I'm really going to have to think about this. Anyway, off to bed for me. An early morning run awaits. 'Night! I am so pleased to announce that my weight has officially dipped into the 140's. 149.5 to be exact. So proud! I'm twenty pounds away from being the lowest weight I have been in my adult life and about twenty-six pounds away from my goal weight. I really am making progress and it feels great. 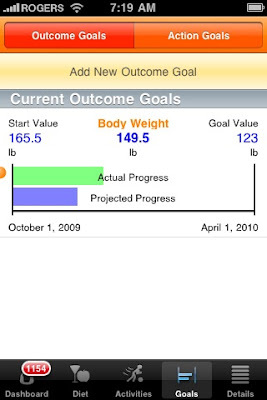 In the spirit of progress, I wanted to share with you some screenshots of my iPhone diet software (Lean Me Pro). 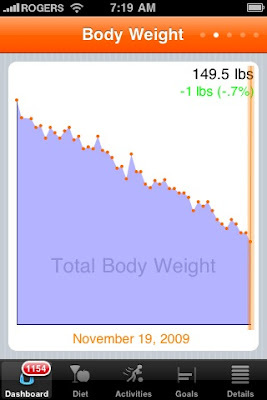 This one shows my projected vs. actual weight loss. And this one shows my daily weigh-ins charted on a graph. The Plan is working. And faster than I expected. I would love to keep up this momentum but I am fully aware that this may not happen; as I get smaller I suspect the weight loss will slow down by some factor. 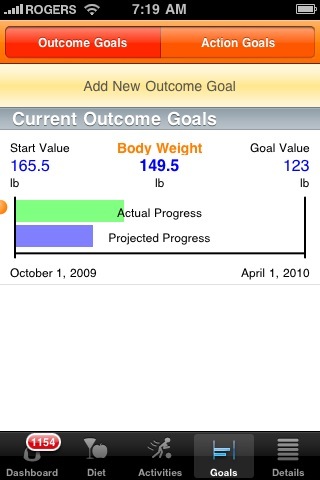 But I'm keeping hopes up that I will indeed reach my goal weight sooner than I originally planned! I am loving the fact that my progress is seeming more and more real. At first, it was just the subjective "feeling better" and "pants fitting less snugly". Then there was a real change in the way my clothes fit, as well as a few compliments. Now I can say that I am officially down 15 pounds and there is no mistaking that I am losing weight. Husband, Baby Girl and I will be attending a wedding in San Francisco in May next year and we've decided to make a mini-vacation out of it and stay for a week. The idea of traveling while being thin sounds fantastic. Especially in the Spring. The though of wearing cute vacation clothes, shopping in San Fran's little boutique stores, and just being active and having fun all around the city is sounding so exciting to me. Increases my motivation to keep going ten-fold. I have never once had a "thin" vacation. Sounds strange to consciously desire such a thing, but I do! I am feeling so done with Cheat Days. They are, almost without exception, always disappointing. Yesterday was no exception, save for a delicious Thai meal that I was able to share with my friend. But for the most part, I ate crap and felt like crap for pretty well the whole day. Neither my body or the scale thanked me this morning. And you know what? IT JUST WASN'T WORTH IT. I have been dieting and exercising with such momentum over the past couple of weeks. It's been lovely to see that scale go down down down. I guess it's true what they say: Nothing tastes as good as thin feels. However, I can't just cut out Cheat Days. Or rather, I won't. I think they're extremely valuable for learning how to eat as well as for hormonal regulation. So I've decided to try something radical in light of all the recent Cheat Day disappointments: I am skipping next week's Cheat Day. I'm a little nervous about this because despite the constant disappointment, I always do look so forward to Cheat Day. So here's the thing - I will take TWO Cheat Days in a row the following weekend. This plan was borne more out of necessity than science. My birthday is coming up and on November 27th, we're having a big family birthday party and on November 28th, I'm having a birthday lunch (and spa day!) with a friend. There truly will be no easy way to even remotely count calories at these events. So, since I have to take two Cheat Days in a row in two weeks, I am skipping next week's Cheat Day altogether. 1. I will actually enjoy a Cheat Day. 2. Since there are 2 Cheat Days in a row, I won't feel the need to pack a bunch of crap into 24 hours. 3. I will have two solid weeks of awesome dieting momentum. This weekly break, while it certainly hasn't hurt me, always does throw things off a little. And you know what? Instead of intentionally gorging myself on whatever crosses my path, I'm really going to try to just behave. And eat like a normal person. Of course there will be birthday cake and such which I fully plan to enjoy, but the rest of my day doesn't have to be unhealthy. My big bowl of plain oatmeal has never sounded so appealing this morning. That's the one great thing about Cheat Day - eating on The Plan sounds so fantastic the next morning by comparison. I know I'm going to eat well and feel great all day and I love that. Another 2 pounds are gone and my BMI is now right smack dab in the middle of "overweight". Since I started on the cusp of "obese", I'm quite happy about that. Getting there. Slowly but SURELY. Well my friends, can you guess what I wore today? Yup, you guessed it. As the title suggests, I pranced around town in my smallest jeans today. And they fit perfectly. Well, almost perfectly - they are a very very low rise cut and honestly, not the most comfortable. Especially when it comes to bending over, which I happen to do all the time now that I spend my days chasing after a very mobile 14-month-old. I even tucked my pants into my Ugg boots, a look that I was never that comfortable pulling off before. I must admit, I looked good today. Baby Girl and I stopped by Husband's office to say hi and we ended up staying for a few minutes (Husband wanted to introduce Baby Girl to some of his coworkers). One of his friends who I met once before about 6 months ago, made a point of mentioning to Husband after I left that I looked like I'd lost weight. When Husband came home tonight and told me that, I was really flattered. Another compliment! I could get used to this. On a completely unrelated note, I am thinking of straightening my hair. Permanently. I am considering having that Japanese Ionic Hair Straightening done. 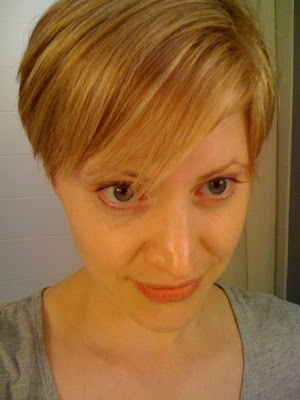 I went and met with a salon today for a consultation. In addition to being crazy expensive, it is QUITE the procedure. First of all, it takes about 4 hours (what would I do with Baby Girl?). Second, you can't get your hair wet for 3 days afterward and you can't use any clips, headbands, hats or anything else that would put a dent in your hair for at least 7 (SEVEN) days afterward. My first thought was - how the heck would I be able to run or go to hot yoga? Both involve (at the very least) sweating. Profuse sweating. Not to mention hair clips and showers. I'm really going to have to think about this. Alright, pointlessly meandering post, this one. Just my random thoughts for the day. Folks, I'm starting to feel like I'm in a rut. The Plan is indeed working, but this weight loss thing is starting to get a bit... boring. It's a looooong journey to be on, and while it is going very well so far, I need some entertainment. A little game to play that will help keep me focused. While I do believe that losing weight is its own reward, I have come up with some Weight Loss Rewards that should hopefully add a little spice to the trip down the scale. I thought this might keep me more engaged, with mini-goals to hit along the way. 1st 10 pounds lost - I get a 75 minute massage at the spa. Since I've already lost my first 10 pounds (check! ), I have already booked the appointment. I am going with a girlfriend at the end of this month and we'll have a lovely leisurely lunch afterwards. I'm very excited. 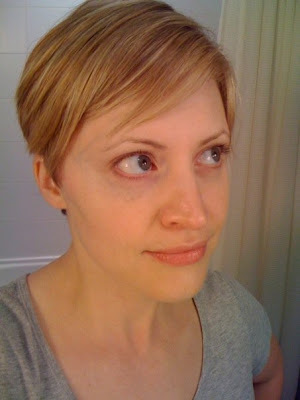 When I get down to 140 - I get a new haircut (needed badly! as evident in my last post! hope I can wait that long!) 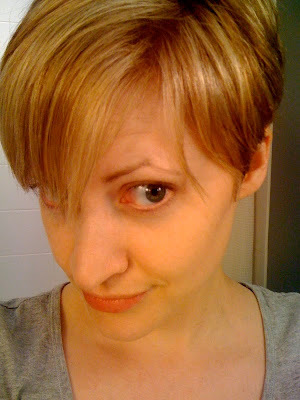 at a posh salon, complete with a colour/highlights (again, needed badly!). When I get down to 130 - I get a facial at the spa AND new makeup and skin care products. Good ones too. None of that drug store crap. When I get down to my goal weight (123) - A NEW WARDROBE! I'm going to need it anyway, because nothing will fit me! I plan to spend about $1000. I'm not sure if this will be enough for all 4 seasons but I'll do my best to get some good quality basics to start with. I haven't talked to Husband about all this yet so hopefully he'll approve! What do you guys think about this? Do you believe in setting mini-goals with a reward system in place? What kind of rewards do you like to treat yourself to? I really want to know! Okay so to preface, it would appear that I really need a haircut. Yikes. 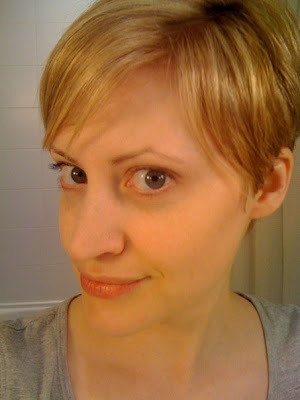 Not a huge difference, but I think I can see some small changes. Anyway, my clothes are definitely looser and I've gone down one, maybe even two dress sizes. Just over 10 pounds lost - about 30 more to go! A wicked Cheat Day was had yesterday, and although it wasn't perfect, it was certainly the best Cheat Day I think I've had yet. Complete with extravagant oatmeal (topped with banana and shortbread cookies!) for breakfast, a salmon sandwich with pretty much an entire bag of Sweet Onion Kettle Chips for lunch and pizza for dinner. You think I stopped there? Oh no I did not. I also purchased $10 in mini-cakes from the fancy french bakery downstairs and ate them all up, leaving not a crumb, and ohhhhhhhh. You definitely get what you pay for when it comes to desserts. And I even managed to squeeze in a nice long run. All in all, pretty darn good. My scale is only punishing me with one pound this morning so I really can't complain. And I suspect much of that 1 pound was from the salty chips. Whatever. It's all good. And it always feels so wonderful to wake up the day after Cheat Day, feeling satiated and happy, and eager for some plain, healthy food. I can't believe I'm saying this but healthy, energy-giving food sounds so much more delicious than high calorie, sugar and fat laden food right now! My bowl of plain oatmeal and apples this morning was fabulous. I almost get the same high returning to The Plan that I get from embarking on a Cheat Day. Nice. So today, I'm going to go for a night run (weather permitting) and a hot yoga class in the afternoon. Good times! I also hope to finally take and post those darn progress pics later today. I'm anxious to see if you guys notice any difference. And with regard to photos in general, I have been slacking. I don't know why. Will try not to be so lazy and be better at including more pics in this blog going forward. My name is Rachael. My daughter was born over a year ago and I still look pregnant! I want to be a strong, healthy role model for my child and I wouldn't mind being a hot mama too. I'm trading in my sweets for the sweet life....... and it starts right now. Choose a start date. Allow for enough time to prepare. Decide on a plan. Know that life is going to change. Get prepared. Plan some menus, buy some groceries. Accept that it's going to be hard work and take a long, long time. Make it as easy as possible. Employ modern gadgetry! Tell everyone about the plan. Anyone who'll listen. It helps to stay accountable. Fidget, pace back and forth, take the stairs, go the long way around, etc. It all adds up! Day 30, 31 & 32: One Monthiversary! I believe a blog is waaaay more interesting with pictures. I'm not a skilled or experienced photographer, nor do I have any cool equipment, but I'm not going to let that stop me from regularly outfitting my posts with some pics. All photos contained in this blog are taken with my iPhone.